The Photoshop Elements Organizer is a powerful tool for organizing your library of photographic images. Put simply, the Organizer enables you to streamline your workflow and feel confident that you'll be able to find any photo you need, when you need it. In this course, Tim Grey will guide you through the features and workflow considerations that will enable you to optimize how you organize your photos in the Elements Organizer. Import photos into the Elements Organizer catalog. Identify your favorite photos with star ratings. 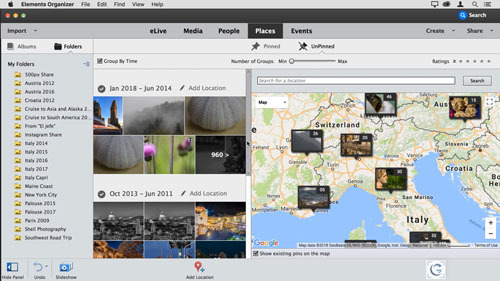 Add location information to your images based on an interactive map. Automatically identify the people who appear in your photos. Add even information to specific images. Organize photos based on the event during which they were captured. Locate images using a wide variety of different criteria. Tim Grey is a photographer who has written eighteen books for photographers, has published hundreds of video training courses, and has had hundreds of articles published in magazines such as Digital Photo Pro and Outdoor Photographer, among others. He also publishes the Ask Tim Grey eNewsletter, the monthly Pixology digital magazine, and a wide variety of video training courses through his GreyLearning website. Tim teaches through workshops, seminars, and appearances at major events around the world.